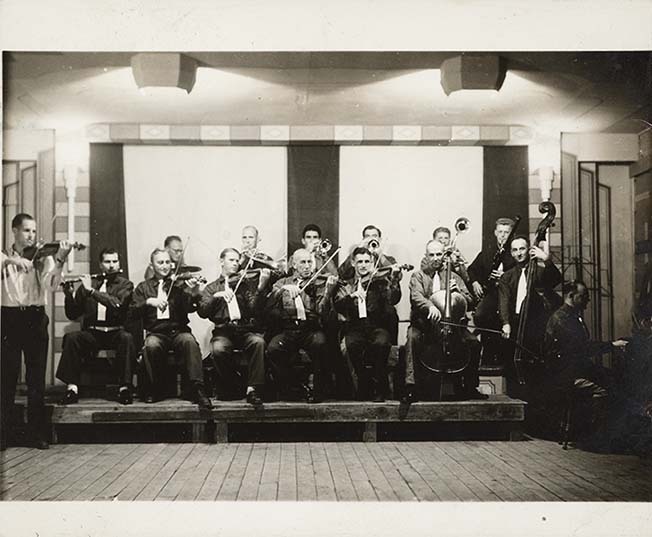 Double row of 15 internees, all but 2 are seated with instruments. They are located within a building; most are seated on a low wooden stage with a theatrical backdrop. All seem to be wearing the camp uniform, a dark jean trouser with red stripe on both legs. All but one also seem to be wearing dark denim shirts which may be part of the camp uniform (unclear if red circle is on the back). Men (except one) are also wearing a white tie. Individual at far left is wearing a white dress shirt. All are shown in the act of playing their instruments including: violins or mandolins, trumpets, french horn, trombone, clarinet, drums, flute, cello, piano and double bass. Photograph is undated; it could have been taken from 1940-1943. As a result, the location of the picture cannot be determined. Although there is no identification card used, the formal setting and formal pose suggests it was an authorized picture, likely taken by a government official. Further the back of the image seems to be stamped "11". This image is clearly taken at the same time as DICEA2011.0001.0006. This photograph belongs to a collection preserved by Italian Canadian internee Osvaldo Giacomelli. Previous to his death, he had spoken on the record about his internment to journalists and academics. Some suggestion has been made that Giacomelli was a fascist supporter and Mussolini-adherent. He was one of the longest-serving of the Italian Canadian internees, released on May 29, 1945. Giacomelli himself felt that he was wrongfully interned, and sued the Government of Canada in 2005. When Giacomelli died in March of 2006, his case was still unresolved.